Tourism in Thailand's historic north is growing fast, not only because accommodation at even the best 5 star hotels in Chiang Mai often cost less than in other destinations in the country, but also because its attractions lie in exactly that for which we embark on a trip to a foreign country in the first place namely; to experience age old culture, captivating historical sights and exotic nature. In the tranquil Maerim Valley 30 minutes from the city centre is where you wake up to views across rice paddies and rain forest covered hills. Here, out of this world spa journeys can be enjoyed at pampering resorts like Panviman and The Four Seasons, the latter offering a window into original northern Thai lifestyle and rustic 5 star accommodation with an authentic touch. While the Maerim Valley is scenic and romantic, luxury hotels on the river Ping are just as ideal if Chiang Mai is to be part of your honeymoon trip. In the city centre which developed around the original old walled city Chedis and temples dot the streets and rickshaw rides take you to historic sights from Tha Pae Gate, the city's ancient entrance. 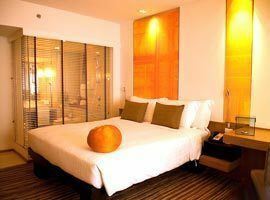 Here we offer the best luxury accommodation deals at many top hotels situated so near historic sights and the famous night bazaar you can easily walk there. The old world charms and historic elegance of this boutique resort set in a tropical garden walking distance from the night market evokes a romantic atmosphere. Rooms feature spacious living areas, patios and Victorian bath tubs. Anantara gets our vote for the best romantic hotel for couples near the city. It is located on the banks of the Mae Ping River allowing enchanting views from your private balcony's daybed while a personal butler is at your beck and call. For a journey into an exotic past Dhara Dhevi's design is inspired by Thailand's historic Lanna kingdom contrasting with colonial era room decor. 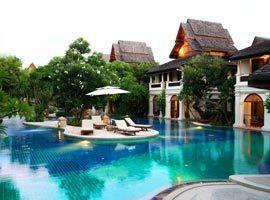 It features one and 2 bedroom villas with outdoor jacuzzis and private plunge pools. 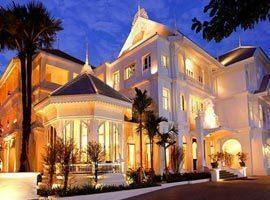 Dusit D2 is a luxury boutique hotel in the city centre near the night market, restaurants and other attractions. It features an award winning spa, an extensive health and fitness club, an award winning restaurant and trendy bar. Snug in the embrace of the forests of Mae Rim Valley where elephants come to greet, and with actual working rice paddies Four Seasons combines an authentic northern Thai lifestyle with luxurious pool villas exuding a rustic appeal. 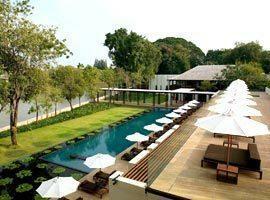 Khum Phaya Resort is part of the Centara Boutique Collection, a hospitality brand you can trust. Unlike many other high-rises in the city Khumpaya focus on original northern Lanna style living with traditional architecture and decor. 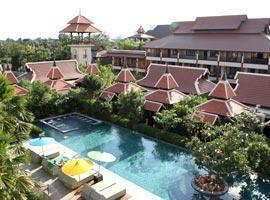 Le Meridien is a city centre hotel near the street market, restaurants and shopping offering charming views of the Doi Suthep Mountains. 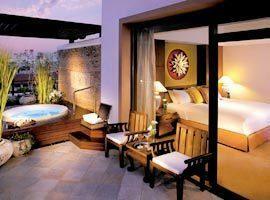 Its chic and modern rooms are equipped with the latest high tech entertainment facilities. Located in the Mae Rim Valley amid forest clad mountains Panviman is a welcome reprieve from the bustling city offering peaceful serenity and privacy. 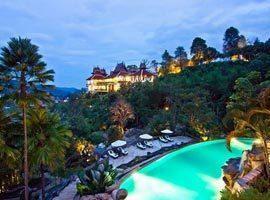 It offers an exceptional spa surrounded by trees and orchards with views of the valley. The elegant and romantic Ping Nakara has only 19 rooms which feature hand crafted furniture and styled to colonial times. It enjoys flawless guest ratings and is located near street shopping and walking distance from the river. 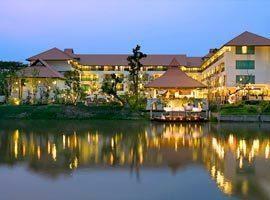 Key features of this riverside resort include an award wining spa featuring exotic massages and beauty treatments. 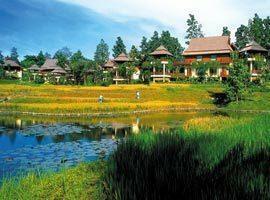 The second is its location on the banks of the Mae Ping River allowing stunning views from its restaurant, pool and rooms. 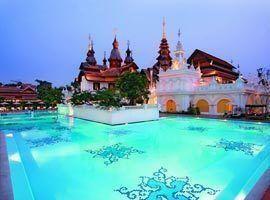 Shangri La is surrounded by attractions, shopping and restaurants and offer elegant rooms with mountain views. The Lotus and Aranda Suites have equipped kitchens and most rooms feature separate lounge areas. Siripanna offers authenticity by featuring its own rice paddy and working garden of fruits and plants for an original northern Lanna lifestyle experience. 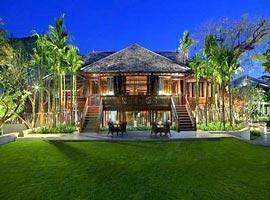 Villas and suites feature essential elements of Lanna culture and private terraces.